Going into Antichamber, I wasn't entirely sure what to expect. I had this vague concept of what it might be like, given the minimalistic style and knowing that it was a first-person puzzle game. But it ended up being remarkably different from the rough approximation I had put together. Unfortunately, this is one of those games that isn't easily described outside of explicitly spoiling puzzles -- which I wouldn't want to do -- and even then, that's missing the point. In order to fully comprehend Antichamber, you need to play it for yourself. 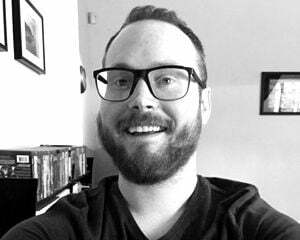 Having essentially run out of competitions to enter (and win), creator Alexander Bruce will finally be ready to let Antichamber out into the wild this year. To give you an idea of the game's pre-release success, it recently took home the 2012 Independent Games Festival award for Technical Excellence. Though it may not necessarily look the part in screenshots, that was a well-deserved win. 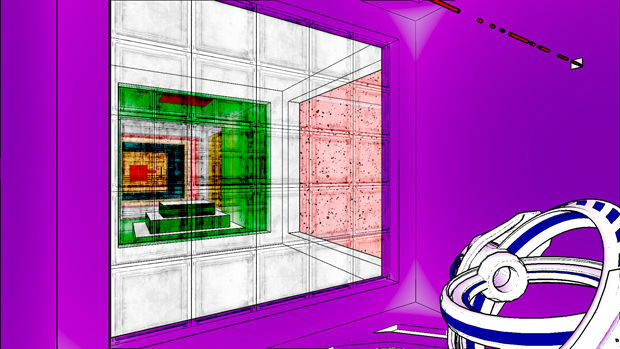 Antichamber leverages smart design and tech to bring an imaginative world to life -- one that makes the most of this medium. While staircases and tunnels that seemingly loop forever might not make sense in our everyday reality, there's nothing holding back dream-like level design in videogames. Its logic may initially seem backwards and sporadic, but against all odds, not once did I feel frustrated with the environment; only curious to understand and explore. I've never cared for games that arbitrarily screw the player over to prove a point about conventions at the expense of enjoyment, and thankfully, that doesn't appear to be an issue here. During my demo, Bruce silently sat next to me, watching as I played. I'm led to believe that this was very much the norm, which explains why the game feels so finely tuned. Having witnessed countless others play the same bits over and over again, he's been able to avoid the pitfalls one might expect of Antichamber through iterative design. 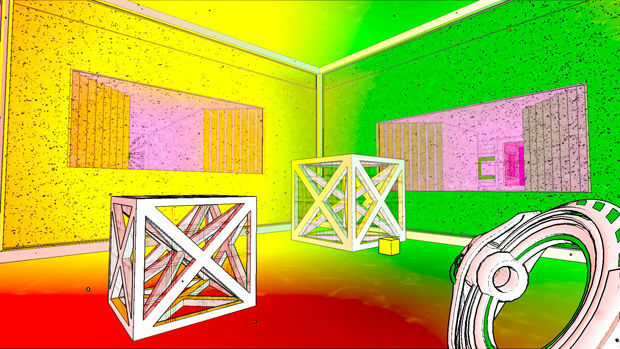 At its core, I understood Antichamber to be a game about learning. Not "learning" in the sense of memorizing a series of facts or rules, but rather, what happens when you are captivated enough to build more abstract mental connections and seek out further knowledge surrounding a given subject. Bruce told me about an influential trip to Japan in which he knew enough Japanese to get by on a day-to-day basis, making it an exciting journey across unfamiliar territory. He contrasted this with a visit to China. Because he didn't have as strong a language base to build from, he felt totally overwhelmed by the experience. Bruce believes the former trip is evocative of Antichamber. I'm inclined to agree. The in-game choices I encountered weren't so much "right" and "wrong" as they were "Choice A" and "Choice B." You'll still need to solve puzzles to see all there is to see, but you'd be surprised by how far you can get simply by trying the unexpected. Antichamber relies on a familiar first-person perspective and works to undo the kinds of preconceived notions we've built up over years of gaming. Simply put, it's incredibly refreshing. In addition to the gun-esque tool used to pick up and put down colored blocks that's shown in these images, things as simple as how long you gaze upon an object and where you're looking while moving can factor into solving puzzles. In fact, calling some of them "puzzles" is a disservice. What many of us will associate with that word is conceptually too straightforward for the challenges found here. I know I'm being vague about the gameplay of Antichamber, but again, to describe it with much more detail would be to ruin the surprise. As much as I want to get my hands on the finished version of Antichamber, I'm almost looking forward to seeing how everyone else reacts to it more. It's a strangely personal game, one that will surely result in fans detailing fascinating stories on message boards and the like. I wondered how Bruce was going to market this game, considering its perplexing nature. Gaining praise from critics by entering it into every competition imaginable was part of the plan, as is having people like me write about our individual experiences. The ultimate goal is to get would-be players to take a leap of faith based on positive word of mouth. 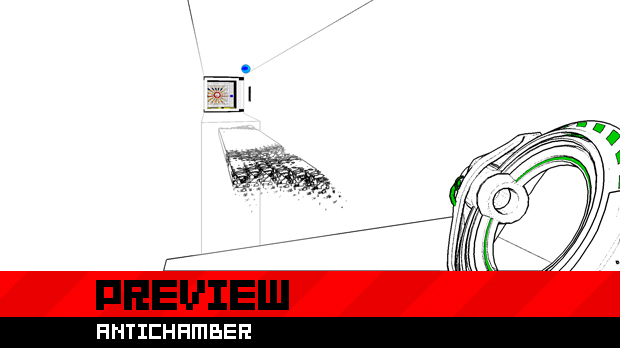 Those attending PAX East next month will want to put Antichamber on their to-play list. It was my personal highlight of the Game Developers Conference, and it could just as easily be the most interesting game you'll get to play in Boston. Look for it over at booth #770.